This article explains how to configure the webservice task of SEBLOD 1.x for the export of content in joomla 1.5.x. A CSV file is generated after the execution of this task. 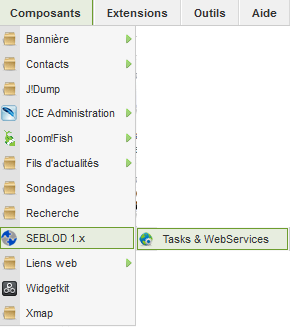 This add-on is available in back-end by the menu link "components => SEBLOD 1.x => Tasks & webservices". Then, you should click on "Task Manager" in order to access the export task of joomla content. Before starting the description of the export process settings, you should save your changes before the start of each export process. To start export process, you should click on "Process" button. To save export process settings, you should click on "Apply" or "Save" button. Select option "Export (Content)" in order to configure an export process of joomla content. Select an option to choose the character which separate the fields in the exported CSV file. option 3 (Subcategories Only): only the articles of the subcategories of "cat A". 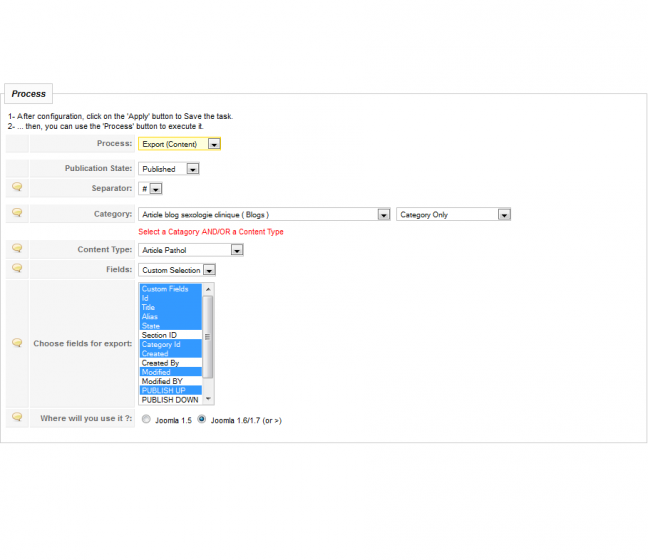 Select an option to choose the content type of the articles to export. If you select option 3, then the parameter "Choose fields for export" appears. Select one or more fields from the multiple drop-down list. Select an option to choose which version of joomla in which you choose to import the generated CSV file.